The first book by a respected journalist on Nearing Death Awareness—similar to Near-Death Experience—this "fascinating" (Kirkus Reviews) exploration brings "humor, sympathy, and keen critical intelligence to a topic that is all too often off-limits" (Ptolemy Tompkins, collaborator with Eben Alexander on Proof of Heaven). People everywhere carry with them extraordinary, deeply comforting experiences that arrived at the moment when they most needed relief: when they lost a loved one. These experiences can include clear messages from beyond, profound and vividly beautiful visions, mysterious connections and spiritual awareness, foreknowledge of a loved one's passing—all of which evade explanation by science and logic. Most people keep these transcendent experiences secret for fear they will be discounted by hyperrational scrutiny. Yet these very common occurrences have the power to console, comfort, and even transform our understanding of life and death. Prompted by her family's surprising, profound experiences around the death of her father and her sister, reporter Patricia Pearson sets out on an open-minded inquiry, a rare journalistic investigation of Nearing Death Awareness, which Anne Rice praises as "substantive, eloquent, and worthwhile." Opening Heaven's Door offers deeply affecting stories of messages from the dying and the dead in a fascinating work of investigative journalism, pointing to new scientific explanations that give these luminous moments the importance felt by those who experience them. Pearson also delves into out-of-body and near-death experiences, examining stories and research to make sense of these related but distinct categories. 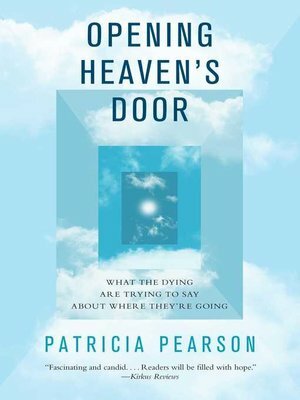 Challenging current assumptions about what we know and what we are still unable to explain, Opening Heaven's Door will forever alter your perceptions of the nature of life and death.